When people ask about my latest book project and I tell them about Iowa’s Ag History, I get two reactions: either a blank stare, or “Oh cool!” When I reached out to Iowa Senator Charles Grassley, a farmer, to share a few comments for the book, I received more than an enthusiastic response. When did your family start farming in Iowa? 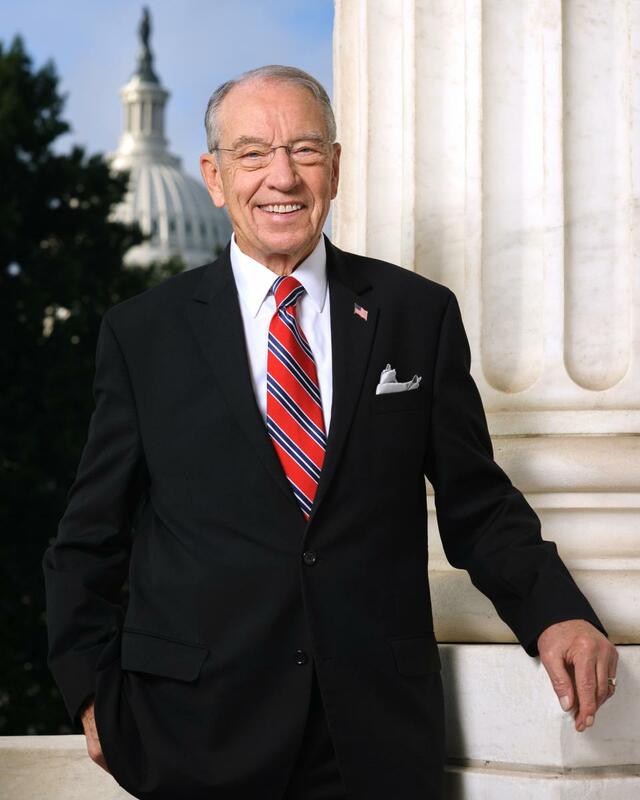 I am the second generation farmer in my family, following in the footsteps of my father Louis Grassley. His dad emigrated from Germany and died when my dad was just seven years old. At around age 18, my dad started working as a hired hand for the Heitland family on a farm in Hardin County. A few years later, he rented some land near New Hartford in Butler County. In 1927, he and my mother Ruth purchased their own parcel of land. After graduating from high school, I worked in factories, attended college and farmed with my dad. In 1958, while running for the Iowa legislature and working towards my doctorate at the University of Iowa, I started farming my own piece of the family farm. When my dad passed away in 1960, I rented his 80 acres and about five years later, purchased 120 acres on my own. When I started out, I grew a bit of everything like most farmers at the time. I grew corn, soybeans, oats and alfalfa and raised sheep, cattle and hogs. My son Robin Grassley, a third-generation farmer, and I continue farming 750 acres together. He rents and owns other farmland along with my grandson Pat Grassley, who is a fourth-generation family farmer. Barbara and I raised our five children together on our farm near New Hartford, and we enjoy passing on our agrarian heritage and celebrate family gatherings here with our grandchildren and great-grandchildren. In politics as in farming, a solid understanding of the past is vital to understand current issues. From your unique viewpoint as a senator and a farmer, what’s your take about why it’s important to be well-versed in history–and what are the perils of not knowing history? As a lifelong farmer who also has worked for six decades representing Iowans in state and federal government, I wear my rural roots as a badge of honor and believe it’s important for farmers to have a seat at the policy-making tables. Farmers take the long view of things, and maybe that’s why they don’t forget important lessons from history. Only two percent of the American population shoulders the responsibility for growing enough food to feed the U.S. population. Our agrarian-based heritage has experienced rapid transformation in the last generation. Fewer Americans, even in Iowa, have a direct link to living or working on a farm. And most likely due to the affordable abundance of food, not enough people appreciate that food security is directly tied to national security. Food security extends beyond national sovereignty. American agriculture – and the farmers, workers and businesses along the supply chain – anchors the U.S. economy and increasingly strengthens U.S. energy independence, as well. From a historical perspective, there are two rules of thumb I use to explain how important food security is to maintain peace and prosperity in society. As Emperor of France in the early 19th century, Napoleon Bonaparte reportedly said “to be effective, an army relies on good and plentiful food.” In other words, an army marches on its stomach. Food security ensures a nation can feed its military, whose men and women in uniform are deployed to protect and defend a nation’s sovereignty, at home and abroad. I also like to remind policymakers that any society is only nine meals away from a revolution. Political leaders who embrace the misguided notion that socialism is the answer to peace and prosperity are either grossly misinformed or willfully ignorant about the peril of leaders who promise to fix “inequality” with government control. Just look at the economic crisis in Venezuela, once one of the most prosperous nations in the Western Hemisphere. The poverty and humanitarian crisis falls squarely in the hands of the nation’s authoritarian regime and its ideologically driven policies. History teaches us that when government suppresses freedom and liberty, the people’s path towards peace and prosperity is replaced with food and medicine shortages, hyperinflation, power outages and even more economic and social inequality. History teaches us other important lessons. Namely, how not to repeat the mistakes of the past. Don’t forget, the overly harsh tariffs in the Smoot-Hawley Tariff Act of 1932 shut down world trade, led to a worldwide economic depression and foretold a world war that killed tens of millions of people. Another important lesson I keep in mind at the policy-making tables is the 1980s farm crisis. The loss of thousands of family farms was a heart-wrenching loss for so many families and long-time neighbors across Iowa. It stole a sense of vitality from small towns and rural communities. It arguably steered away a generation of beginning farmers from following in the footsteps of their parents and grandparents. The farm crisis invigorated my advocacy on behalf of young and beginning farmers, including my work to push for robust enforcement of anti-trust laws and oversight of mergers and competition in the agriculture industry. Previously, I’ve introduced legislation that would have amended the Packers and Stockyards Act to make it illegal for a packer to own, feed or control livestock intended for slaughter. I’ll keep my oversight hat on to protect the integrity of the marketplace so that independent producers have a fair shake at a fair price for their commodities. I also led efforts to enact and make permanent Chapter 12 in the federal bankruptcy code. This unique chapter is designed to help farmers and ranchers who have fallen on hard times to survive bankruptcy and restructure their debts without losing their livelihood. Most recently, I secured an update to Chapter 12 to fix court rulings that undermined congressional intent. Previously, the IRS muscled its way to the front of the creditor’s line to scoop up capital gains taxes and potentially block a farmer’s reorganization plans. Farmers shouldn’t be penalized for being asset-rich and cash-poor. When they need to reorganize debts to hold on to their livelihoods, my reforms ensure they aren’t going to be slapped with a big tax bill and lose the ability to continue farming. Another way I advocate for family farmers at the policy-making tables is my longstanding efforts to restore fiscal integrity to the farm safety net. In our free market society, farmers ought to be able to decide how large or small they want their operation to be. However, the farm safety net shouldn’t be manipulated for operations to grow at taxpayer expense. It’s very important to uphold the credibility and strengthen the public trust in the farm safety net, as well. That’s why I will continue my efforts to attach reasonable payment limits so that off-site managers, including nieces, nephews, cousins and other family members who aren’t actually contributing to the operation of the farm, are prevented from cashing in on farm payments. In 2019, I launched my 39th consecutive year holding meetings in each of Iowa’s 99 counties. I keep in close touch with Iowans and count on this dialogue to make representative government work. I also apply the lessons of history to inform my work on making better policies and fixing laws that create unintended consequences. As chairman of the Senate Finance Committee, which has oversight and legislative jurisdiction over international trade, I’m currently working to reform a 1962 federal law that delegated authority to the executive branch. Specifically, Section 232 of the Trade Expansion Act authorizes the president to impose tariffs on selected imports if the chief executive determines those imports pose a threat to our national security. This law was enacted with good intentions and for good reason. However, history has shown that reforms are necessary in order to give Congress a role in the process. In my view, Congress delegated too much authority to the executive branch at the expense of the people’s branch. American agriculture too often shoulders the burden of retaliatory action from our trade partners. It’s another example of why I always check the rear-view mirror to ensure the road ahead paves the way for prosperity and opportunity for family farmers and all those who earn their livelihoods and enjoy their way of life in Rural America. What are some of the biggest changes in Iowa agriculture you’ve seen and experienced in your lifetime? Technology and innovation have revolutionized farming as we know it. Mechanization allows an individual farmer to dramatically improve productivity and harvest bin-busting yields grown from disease-resistant seeds, for example. At the same time, farmers are able to conserve resources and save money using no-till, cover crops and precision agriculture. As a first-generation farmer, my dad used a team of horses when he started farming. Like many family farmers, the genetic code of fiscal discipline, conservation and ingrained work ethic was handed down to me from my parents’ experience carving out a living from the land. In my case, the Grassley household and farming operation was influenced by the Great Depression, to conserve resources and stretch every penny. To this day, I carry a lifelong code of conservatism with me as a farmer and lawmaker. Although innovation – including WiFi-enabled farms and climate-controlled tractor cabs — hasn’t shortened the work day for most farmers, it’s certainly transformed productivity and changed the way we market our crops and livestock. When I started farming on my own in the 1950s, the average corn yield in Iowa was about 45 bushels/acre. Today Iowa farmers yield an average of 202 bushels/acre. This productivity helps feed and fuel a growing world population with affordable, wholesome food and renewable energy. So increased productivity has been revolutionary. Another significant change is farmers are affected by worldwide market forces. That means a farmer in the 21st century must be able to survive not just the whims of Mother Nature, but also the winds of geo-political negotiations and foreign policy that impact exports and a farmer’s bottom line. Ag literacy should be part of education, in my opinion, for any Iowa student. In your opinion, how does a basic understanding of agriculture benefit all Iowans, both rural and urban? No matter what policy we may be debating in Congress, I often find the best way to sum up the debate boils down to this: Washington is an island surrounded by reality. As a farmer-lawmaker on the Senate Agriculture Committee, I bring a dirt-underneath-my-fingernails perspective to the policy-making tables. I take pride serving as a champion for rural America to advocate for our nation’s food producers and farm families. With only two percent of the population growing food for the rest of the nation, it’s more important than ever to educate consumers about where their food comes from. In fact, I often suggest that many Americans are under the mistaken impression that food grows in grocery stores, restaurants or take-out containers. I’m glad to see more and more farmers’ markets becoming a vital part of local communities. It’s good for the local economy and community vitality and fosters better awareness that food does not grow on the grocery store shelf. With a global population expected to reach nearly 10 billion people by 2050, the importance of agriculture research and education is vital for human civilization. Iowa’s deeply rooted agrarian heritage continues to lead the way with excellent opportunities to foster ag literacy, food, plant and animal science and entrepreneurship. Iowa boasts a vibrant network of FFA organizations across the state. What’s more, Iowa’s native son Norman Borlaug paved an agricultural revolution credited with saving a billion people from starvation. The Father of the Green Revolution was awarded the Nobel Prize in 1970 and Iowa celebrates his legacy with a statue in the Rotunda of the U.S. Capitol. Iowa is also home to the World Food Prize. Since 1987 the World Food Prize Foundation has celebrated the achievements of individuals inspired by the legacy of Dr. Borlaug. Each year it awards individuals whose contributions have improved the global food supply, from plant, animal and soil science to technology and nutrition and rural development. For three decades, it has brought thousands of people from around the world to Des Moines in October to talk about food security in a symposium known as the Borlaug Dialogue. Anything else you’d like to add about the importance of knowing history in general and the history of agriculture in Iowa in particular? Iowans may know I love history. In today’s polarized world of identity politics, it’s important more than ever to strengthen civic education in America’s classrooms. Our youngest members of society need to understand the perils of communism, fascism and socialism. Regimes inspired by utopian socialist principles do not eradicate hunger or poverty, they extinguish peace and prosperity at the expense of individual freedom and liberty. Despite the regional, ideological and partisan differences that divide Americans, we share a common humanity and fundamental thread of human existence. We all need to eat to survive. And I’m proud to be among the generations of Iowa farmers who have answered the vocational calling to put food on family tables. As a steward of the soil and U.S. Senator for Iowa, I am honored to serve as a voice for agriculture and rural America. It’s hard to imagine a time when John Deere wasn’t a powerhouse in the tractor business. 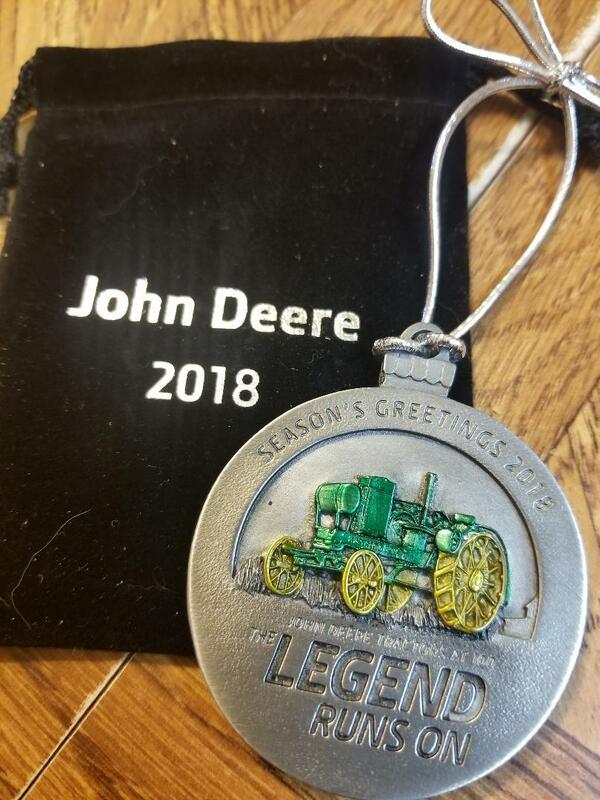 Yet, John Deere wouldn’t enter the farm tractor business until March 1918 through the acquisition of the Waterloo Gasoline Engine Company, and it’s a milestone that has been commemorated in everything from butter to Christmas ornaments. Deere has featured a picture and story depicting the 100th anniversary of the iconic Waterloo Boy on its 2018 Christmas ornament. 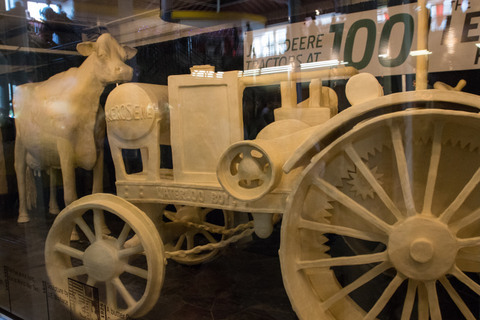 The 2018 Iowa State Fair also honored the tractor by featuring the world-famous Butter Cow beside a butter sculpture of the Waterloo Boy. 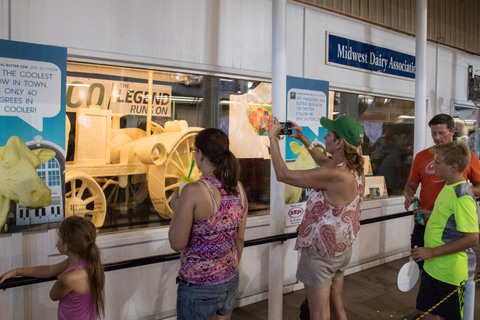 Both butter masterpieces were displayed in the 114-year old John Deere Agriculture Building’s 40-degree cooler throughout the fair, which ran from August 9-19. Frequently ranked as one of the top events in the country, the Iowa State Fair is the single largest event in the state of Iowa and one of the oldest and largest agricultural expositions in the country and annually attracts more than a million people from all over the world. In 2018, the Iowa State Fair used more than 50 John Deere tractors and utility vehicles provided by Van Wall Equipment. In addition, a 1919 Waterloo Boy model N tractor was on display in the Machinery Grounds at the Iowa State Fair. To understand the significance of the Waterloo Boy, take a trip back in time, said Neil Dahlstrom, manager of the John Deere Archives and History. In the critical five-year stretch (1912-1917) prior to John Deere entering the tractor business, there were two key issues the company needed answered. “First, what did farmers really want from a machine that would soon make the horse obsolete?” said Dahlstrom, who noted that salesmen, territory and branch managers, and Deere’s top leadership scoured the country to understand what customers desired. Also, how could the equipment to be manufactured to be durable enough to stand up to daily farm use? Deere had considered every imaginable idea. The company had developed one-, two- and four-cylinder concept tractors. Some ran on gasoline. Others ran on kerosene. Some had all-wheel drive. Others had front-wheel drive. The company even explored concepts like line steering, which was meant to replicate horse reins as the steering mechanism to ease farmers into power farming, Dahlstrom said. A motorized cultivator, what Deere called a “Tractivator,” was brought to market by several competitors, but Deere determined it did not provide any cost savings compared to horses. The challenge of producing a durable tractor loomed large. In a letter to company president William Butterworth in 1915, Deere’s superintendent of factories George Mixter noted that tractors offered by competitors up to that point “have not been built with the proper spirit behind the design and manufacture to insure their durability in the hands of the farmers.” But if Deere could “build a small tractor that will really stand up for five or more years’ work on the farm, I believe they will be a permanent requirement of the American farmer,” Mixter wrote. Deere ultimately found the solution with the Waterloo Boy tractor and acquired the Waterloo Gasoline Engine Company in Waterloo, Iowa, on March 14, 1918. Although anxious to start selling the Waterloo Boy, Deere dealers had to wait while Deere honored existing contracts, which did not expire until Dec. 31, 1918, Dahlstrom said. 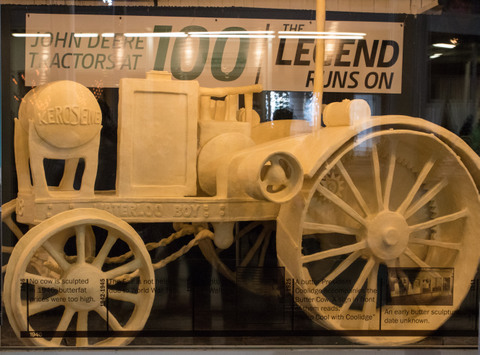 Visitors snapped photos of the iconic Waterloo Boy butter sculpture 2018 Iowa State Fair. Deere put its money where its instincts were. Over the next year, the company spent more than one-third of its advertising budget touting the Waterloo Boy tractor, Dahlstrom said. Specifically, Deere invested $50,000 on tractor advertising in the year following its debut of the Waterloo Boy—approximately $747,000 in today’s money. Another way to get the company’s new product out in front of customers was to take it on the road – literally. The National Tractor Demonstrations started to become more mainstream after being introduced in the United States in 1913. An eight-city, eight-week tour schedule was the perfect opportunity to unveil Deere’s Waterloo Boy, Dahlstrom said. Salina, Kansas, served as the ideal backdrop in August 1918, since this was the nation’s largest demonstration. Deere had participated in tractor demonstrations since the original Winnipeg Agricultural Motor Competitions in Manitoba, Canada, in 1908 – but not with a tractor. Instead, Deere had paired its plows with leading tractor manufacturers. That changed now that the Waterloo Boy was part of the Deere family. At Salina, Deere spared no expense, showcasing 12 Waterloo Boy tractors as the centerpiece of a display that included John Deere signs, Waterloo Boy signs and a copper leaping deer statue, Dahlstrom said. “There were two stars during this week of 100-degree days – ‘ice water on tap’ and the Waterloo Boy Model ‘N’ tractor,” he added. The Model “N” demonstrated its merits by pulling tractor plows, disc harrows and grain drills. Visitors were shuttled in three John Deere farm wagons pulled by Waterloo Boy tractors. By all accounts, the debut was a success. “The award for the most elaborate, largest and most artistic exhibit tent at the Salina tractor show will undoubtedly go to the John Deere Plow company of Kansas City,” wrote the editors of a Kansas City newspaper. After years of development, John Deere customers and John Deere dealers finally had their John Deere tractor. “It took longer than the company expected, but a determination to do it right instead of doing it fast now brought the John Deere tractor to market,” Dahlstrom said. The tractor era had officially arrived. Barn quilts have become a folk-art phenomenon in Iowa in the past 15 years, turning up not only on barns, but mailboxes, gardens, buildings in town and more. But there was a time not that long ago when no one had ever heard of a barn quilt—not until Donna Sue Groves wanted to add a little color to her corner of the world. Her story—and those of barn quilt enthusiasts in places like Sac County—inspired the 53-minute documentary “Pieced Together,” which filmmaker Julianne Donofrio showed in Sac City to a full house at the First Christian Church on the evening of Sept. 24, 2018. The story, which includes many barn quilts across Iowa, began in 1989 when Groves’ family bought a farm in Adams County, Ohio, near the Ohio River Valley at the foothills of the Appalachian Mountains. Groves made a casual remark to her mother, Nina Maxine Groves, about an uninspiring, time-worn tobacco barn on the farm. 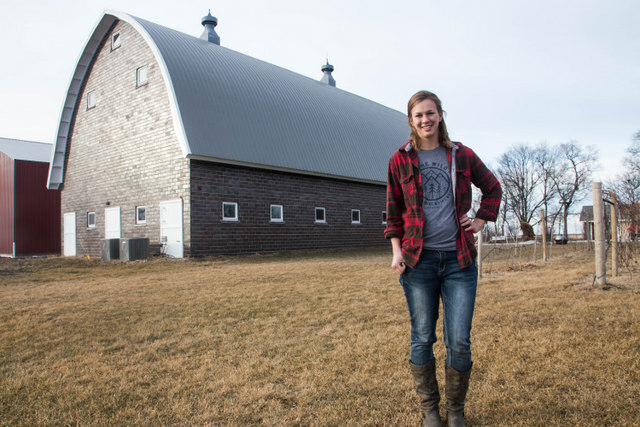 Groves’ interest in barns dates back to her childhood. When her family would visit Groves’ grandmother in Roane County, West Virginia, Groves’ mother invented a car game to keep Groves and her brother quiet. Some barns were worth two points, while others were worth three points. If a barn had outdoor advertising, like “Chew Mail Pouch” or “RC Cola,” players got a 10-point bonus if they could read the lettering. Red barns also earned higher points. The chance to earn even more points awaited when the family’s wider travels took them past Pennsylvania Dutch barns with colorful, geometric hex signs. The game led to discussions and questions about the barns, such as who built the barns, and for what purpose. Groves enjoyed these conversational teaching moments. “I looked forward to seeing barns,” she said. This history eventually inspired Groves’ involvement with the first barn quilt square, an Ohio Star pattern, which was created in October 2001 and displayed in Adams County, Ohio. This small gesture triggered a ripple effect across North America. As more people wanted to create barn quilts, Groves and her fellow volunteers quickly learned that painting barn quilts directly onto barns didn’t work too well, but painted plywood squares offered a much better option. These opportunities for economic development, combined with the visual appeal of barn quilts, soon inspired a “clothesline of quilts” across America. Residents of an adjoining county, Brown County, Ohio, loved Groves’ idea and asked how to get involved. Folks in Tennessee read an article about the Ohio barn quilt project, called Groves and wanted to know how to do a similar project in their area. Grundy County, Iowa, also got involved in 2003, followed by Sac County. When Sue Peyton and her family from rural Sac City heard about barn quilts, it seemed like a good fit for her son, Kevin, who was in high school and looking for a project he could use as a 4-H leadership project and a Herbert Hoover Uncommon Student Award project. The Peytons coordinated the construction and painting of Sac County’s first barn quilts in the summer of 2005. While some people weren’t quite sure what to make of the new barn quilts that started appearing on barns and corncribs around the county, the concept caught on quickly. “We hoped to get 20 barn quilts,” said Sue Peyton, who added that Sac County boasted 55 barn quilts within two years of the start of the project. “I’ve seen a lot of quilt trails, and you embraced this early on and have done a tremendous job,” said Donofrio as she chatted with audience members in Sac City following her documentary. 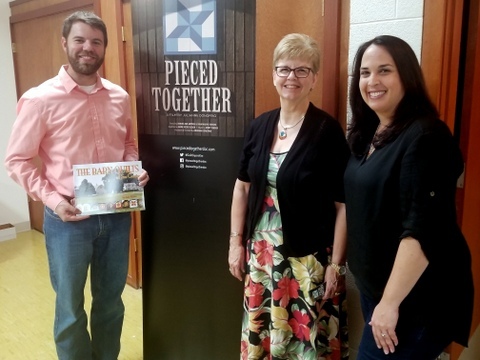 Sac County barn quilt proponents Kevin Peyton and his mother, Sue, (center) welcomed filmmaker Julianne Donofrio, who showed her 53-minute documentary “Pieced Together” in Sac City to a full house at the First Christian Church in September 2018. Anywhere there’s a barn quilt trail, every square tells a story. Also, there’s no right or wrong way to create a barn quilt. “Barn quilts have a storied history as complex and diverse as the quilt patterns themselves,” Kevin Peyton said. 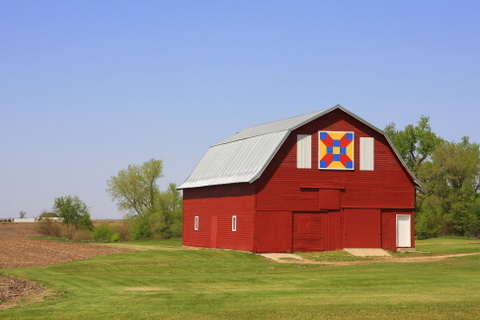 Consider the Double Aster barn quilt pattern on the Hogue family’s 1943 barn north of Odebolt. The pastel-colored design complements the family’s Prairie Pedlar Gardens business. Owner Jane Hogue, who served on the original Sac County Barn Quilt Committee, enjoyed watching the “Pieced Together” documentary. Sac County proves that barn quilts offer an effective way to help save barns, promote rural tourism and boost economic development, Sue Peyton added. She cited the vintage barn at the Rustic River Winery and Vineyard north of Lake View, for example. It has been remodeled not only into a winery, but a venue where people can host parties and other gatherings. 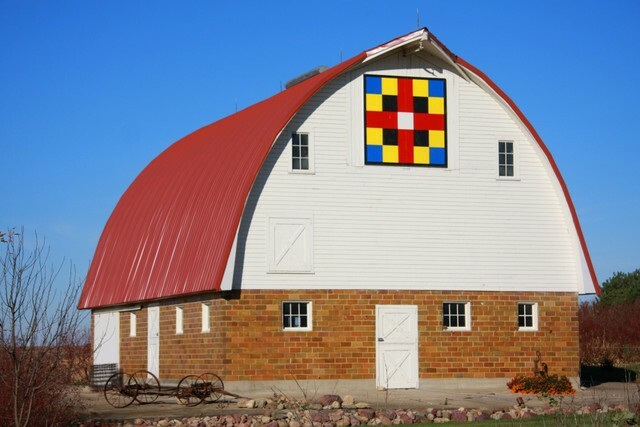 As the history of the barn quilt phenomenon is preserved through projects like “Pieced Together,” barn quilts are being praised as one of the greatest community art projects ever created. While there are barn quilt trails in 42 states, there is no national barn quilt organization, by design. Creating barn quilts at the local allows local people to make their mark, share their history and establish a legacy. “It’s so adaptable—that’s the beauty of it,” Groves said. When Alvin (Al) Liske and his wife, Jean, signed up for the Barn Quilts of Sac County project, they had no idea how much attention this would attract to their stately World War II-era barn west of Early, Iowa. 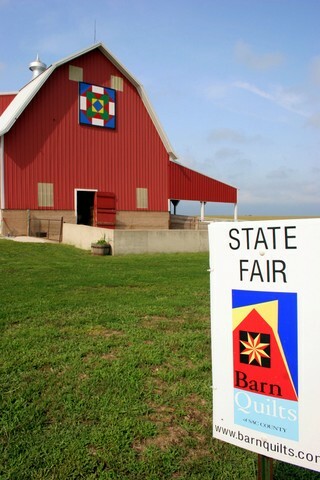 “Our barn has been featured in Eleanor Burns’ book, ‘Quilt Blocks on American Barns,’ and it was also included on the cover of the Department of Transportation’s 2009 map of Iowa,” said Jean. Burns, a popular television personality who gained famed for her “Quilt in a Day” system, visited the Liske barn last year when she traveled to Iowa to participate in the Sac County Quilt-a-Fair. She was especially intrigued by the Country Lanes barn quilt pattern that graces the barn’s haymow door. She noted that Country Lanes is a very old pattern that was originally published by Mountain Mist, a company that began selling quilt batting in Cincinnati in 1846. Jean’s father, Herman Puetz, built the barn for approximately $4,000 around 1943 or 1944 on the Boyer Valley Township farm that his family had purchased in 1930. The new barn replaced an existing barn that was made from cottonwood lumber. After the concrete foundation for the new barn was poured, lumber was not readily available for the building, due to the war. In the meantime, the family roller skated on the concrete slab. “When construction started again, I can also remember going with my parents to Albert Lea, Minn., to get the rafters for the barn, and I thought that was a really long trip,” said Jean, who noted that the barn includes glazed tile on the bottom and originally had wood shingles on the rounded, gothic roof. Jean’s father, who was one of 12 children, also milked cows on the east side of the barn and kept plenty of hay in the haymow. “I’d play in the barn with my brothers and sister, and we’d make tunnels and caves and houses with the bales. When enough hay had been fed, there would be bare spots in the haymow, and we’d play basketball up there,” said Jean, who noted that the haymow still includes basketball hoops. After Jean married Al and the couple moved to the farm where Jean grew up, the Liskes raised cattle and hogs in the barn and farmed from the early 1960s until the 1980s. In 2005, the couple decided to remodel the barn, which still had a good foundation. “It was getting to the point where we needed to fix up the barn or think about tearing it down, and we didn’t want to watch the barn fall down,” said Jean, who noted that the family power washed the interior, rebuilt windows and doors, had the barn rewired, covered the roof with red steel and added a staircase to the haymow. Note from Darcy: I first wrote this piece in 2010 for Farm News. That hobby has taken Gable and her husband, Preston, on dynamic journey that has led to the creation of a small business that’s helping spur economic development in rural Iowa. 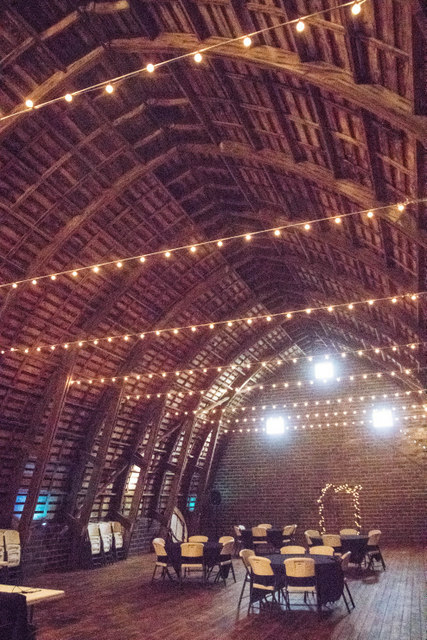 At the heart of it all is a century-old barn that’s central to the story, offering an attractive venue for gatherings, celebrations, music concerts and more. Beyond the tasting room on the main floor, the barn loft holds 150 people. Guests who come to Backcountry Winery for bridal showers, wedding receptions, class reunions and other celebrations enjoy exploring this rural heritage. So do the visitors who stop by for Backcountry Winery’s live music events. For many guests, part of the experience involves learning the story of the winery. In the case of Backcountry Winery, that story began with Preston Gable’s long-time interest in home winemaking. “We’d talk about how we might open a winery someday,” said Amber Gable, whose husband is a fellow northwest Iowa native from Hartley. “Someday” seemed far off, however, when the high school sweethearts started their careers in Ames following their graduation from Iowa State University (ISU). Amber Gable became a landscape designer for an engineering firm, while her husband worked in biofuels research at ISU. Things turned around in 2014, though, when the young couple found an acreage with a house and barn northeast of Stratford. “We really needed a fixer-upper, and this place needed a family to put down roots,” Amber Gable said. After the couple purchased the property in August 2014, they began remodeling the barn within a few months and exploring its history. The abstract for the property goes back to 1920, when the current home on the acreage was built by Alfred Erickson. “We know the barn pre-dates 1920, although we don’t know exactly when it was built,” Amber Gable said. While the barn is structurally sound, time had taken a toll on some parts of the building. “We poured a new concrete floor and replaced the entire hayloft floor,” said Amber Gable, who noted that the barn once housed cattle. After months of work, the Gables opened Backcountry Winery in May 2016. “The barn is still a work in progress, but it has allowed us to open our winery sooner than we anticipated,” said Amber Gable, who appreciates the opportunity to run a home-based business, especially now that she and her husband are raising their 1-year-old son, Ivan. Word-of-mouth marketing, Backcountry Winery’s website and a Facebook page have helped the couple’s business grow. While Backcountry Winery hosted one wedding in 2016, this grew to five weddings in 2017 and has increased to seven weddings slated for 2018. At Backcountry Winery, the Gables grow six varieties of wine grapes. They make 12 different wines, including strawberry, raspberry, cherry and apple wines, and plan to expand to 14 wines soon. The Gables have invested in an expansion near the barn to accommodate these events. A connecting space on the west side of the barn will include a room when brides can get ready for their wedding. This connecting space is attached to a 60-foot by 90-foot addition that will provide additional production space, storage space and office space for the winery. This infrastructure is just one part of Backcountry Winery’s recent expansions. While the Gables maintain a vineyard on the east side of the barn, the couple also began leasing an established, 4-acre vineyard near Webster City in the spring of 2017. This pride is reflected in the large, silver trophy that graces the barn at Backcountry Winery. 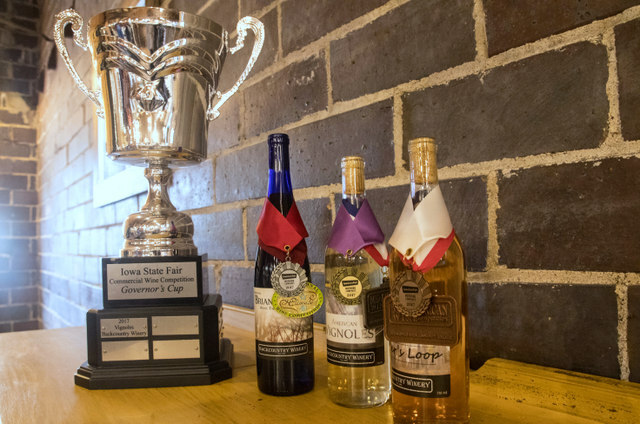 When the Gables competed in the commercial wine competition at the 2017 Iowa State Fair, the judges selected Vignoles from Backcountry Winery for the top honor, the Governor’s Cup. Vignoles is a semi-dry white wine that boasts crisp flavors of tropical and citrus fruits and a clean finish. Vignoles is just one of the wines available from Backcountry Winery, where the Gables grow six varieties of wine grapes. They make 12 different wines, including strawberry, raspberry, cherry and apple wines, and plan to expand to 14 wines soon. 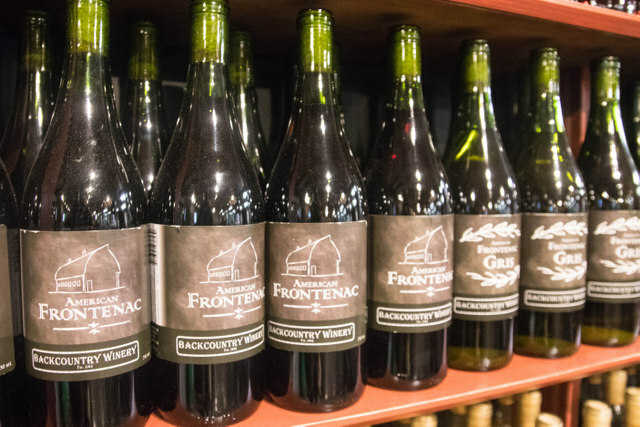 Backcountry Winery’s products can be purchased at the winery or through the approximately 25 retailers in Hamilton County and central, northern and northwest Iowa that partner with Backcountry Winery. The Gables hope to attract more guests to the area by offering more live music this summer at the winery. This builds on the success of the three performances offered in 2016 and the 10 shows offered in 2017. The 2018 concerts, which range from country to classic rock, cost $5 for admission and will be held on certain Saturdays from 6 p.m. to 8 p.m. in the barn. When the Gables competed in the commercial wine competition at the 2017 Iowa State Fair, the judges selected Vignoles from Backcountry Winery for the top honor, the Governor’s Cup. Vignoles is a semi-dry white wine that boasts crisp flavors of tropical and citrus fruits and a clean finish. On average, the typical Iowa winery produces approximately 3,000 gallons of wine annually. The Iowa native wine industry helps promote and establish additional activity in the state, including lodging, food, travel, gifts, agri-tourism, event centers, festivals, music, art and a host of service industries. “By our estimation, based on direct feedback from the wineries we surveyed, there was over $2.1 million in revenue generated from these wine-related events and facilities,” according to the 2012 “Economic Impact of Iowa Wine and Wine Grapes” report produced by Frank, Rimerman + Co, LLP. In order for the industry to keep growing and attracting new visitors, wineries not only need to continue focusing on improving wine quality, but consider expanding into more wine-related events like private parties, weddings and festivals held on winery properties, according to the report. I originally wrote this story for the Progress section of Farm News, Ft. Dodge, Iowa in February 2018. 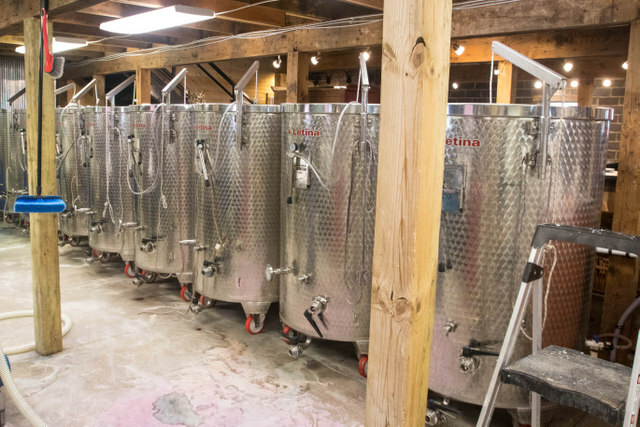 Backcountry Winery’s fermenting equipment is housed in a Hamilton County, Iowa, barn that’s approximately 100 years old. My FFA story is so unlikely that even I can’t quite believe it myself. It all began in the fall of 1989, when I was starting my sophomore year at Southern Cal High School in Lake City. 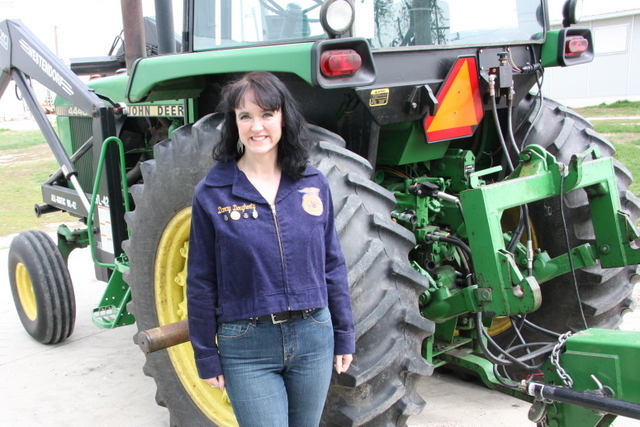 As a child of a Farm Crisis, I never thought about joining FFA. I was busy with classes, band, choir, theater and other activities, and the unspoken message was clear—ag has no future, so don’t spend your time there. Then along came Ed Ricks. Ed was Southern Cal’s ag teacher and FFA advisor. Turns out he was also a talent recruiter. He asked me whether I’d be interested in coming over to the ag building and studying ag rather than taking the standard 10th grade biology class. I was intrigued. Ed worked out an arrangement with the biology teacher so I could skip biology class every day and instead focus on ag, as long as I could pass the biology tests. I’m forever grateful that Ed welcomed me into the dynamic world of FFA. Not only did I love the ag classes, but it was fun to compete on the horticulture/floriculture team at nationals in Kansas City. My ag adventures truly set me a path that has defined my career for more than 20 years. They also explain why I’m sure a big believer in FFA. As I look back, it’s amazing to think how much FFA has changed, and what hasn’t changed, since those days. 1. More diversity. When I was in FFA, there were usually only three to five girls at most in our chapter. That era wasn’t that far removed from the days when girls were not allowed to join FFA (a change that didn’t come until 1969.) Now girls often outnumber boys in many FFA chapters. I was excited that our local South Central Calhoun FFA chapter offered a Diversity in Ag class for the first time this fall, thanks to advisor Matt Carlson, to help girls learn more about the diverse career options available in ag today. 2. Ability to inspire. As I worked with the Diversity in Ag students, I remembered just how influential adults can be at this point in an FFA student’s life, and how much we can inspire the next generation of ag leaders, if we only take the time. 3. Learning made fun. While “fun” doesn’t come to mind when I think of most of my high school classes, it’s a word I’ve always associated with ag education. That all stems from my positive experiences in FFA, from working in our greenhouse to competing with teams that traveled from Ames to Des Moines to Kansas City. 5. Real-world connections. These FFA lessons, from soil conservation to sales and communication skills, aren’t just academic theory. They have real-world applications that continue to influence my approach to business, farming and life. 6. Broadening your horizons. Being recruiting into FFA opened up a whole new world of career options I might never have considered. While there isn’t an abundance of children of the 1980s Farm Crisis working in agriculture, I consider myself to be one of the fortunate ones, all because Ed Ricks helped me broaden my horizons. 7. Useful knowledge you don’t learn anywhere else. When I’m at a meeting, I can tell who’s an FFA alum and who’s not, simply by whether a person knows how to conduct a meeting properly with parliamentary procedure. This is such a useful skill, and it’s curious to me that FFA is one of the few organizations that seems to understand its value. 8. Giving back. I remember helping plant and water the flowers in the planters around Lake City’s town square as part of our FFA training. While I just thought this was a fun way to get away from school for awhile, lessons like this helped plant the seed of community service in my life. 9. Leadership. As I volunteer with local FFA chapters today, I’m always inspired by the leadership opportunities that kids embrace at the chapter, district, state and even national levels. A dedicated FFA member always stands out among his or her peers. Some of FFA’s most notable alums have ascended to the highest levels of their chosen professions, from President Jimmy Carter to professional athletes like Bo Jackson to country music superstars Tim McGraw and Taylor Swift. 10. Focus on the future. As I look back, I knew I had a good thing going in high school with FFA, but I wish would have understood even better the amazing opportunities I had. It says a lot about an organization when you realize more of its value the longer you’ve been away from it. I’ve never understood why a smoky, delicious ham and bean soup is so hard to find. Heck, just a lackluster, ho-hum ham and bean soup is often hard to find. I always figured no one knows more about ham and bean soup than Iowa farm cooks, especially when those who grew up on a hog farm like I did. Pork galore in all its forms was a staple on our family’s dinner table for generations. Plus, soup night was always Sunday night at our farm—and it still is. What a treat when ham and bean soup is on the menu! 1. You MUST have a thick, smoked ham hock (also known as a ham shank) to make the magic. No cubes of cured ham are going to cut it, if you want maximum flavor. This is a heavy-duty, low-and-slow kind of job for a tough, smoky ham shank. 2. 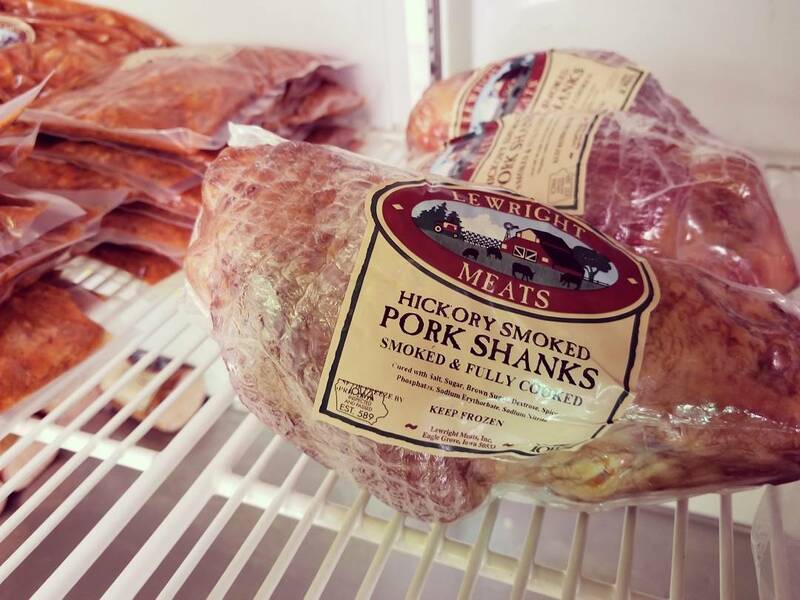 We’re blessed to have many great meat lockers in Iowa, a reflection of our thriving livestock industry, where I can get fabulous smoked ham hocks. One of my favorite suppliers? Lewright Meats in Eagle Grove, which has been serving northern Iowa since 1936. 3. Adding diced potatoes is a good thing for ham and bean soup. I like to add oomph to my cooking, and how can you go wrong with extra veggies? Adding potatoes might be a bit non-traditional for ham and bean soup, but that’s how I roll. This smoked ham hock from Lewright Meats in Eagle Grove is the key to a great ham and bean soup. Obviously, ham and bean soup isn’t just a farm favorite. Turns out it has a rich history in the kitchens of Washington, D.C., too. While ham and bean soup was a common item on the U.S. House of Representatives’ menu before the turn of the 20th century, it became a permanent fixture in the institution when Speaker Joe Cannon of Illinois discovered that his favorite meal had not been prepared by the kitchen staff on a hot, summer day in 1904. Cannon, who was the namesake of the Cannon House Office Building, served in the U.S. House for 46 years. Dismayed by that egregious menu omission in 1904, the Speaker directed that bean soup be served in the House every day, regardless of the weather. More than a century after Speaker Cannon’s decree, bean soup remains on the menu in the House Restaurant, making it one of the more longstanding and famous traditions in the House. Members of the U.S. House aren’t the only fans of ham and bean soup. It’s also on the menu in the Senate’s restaurant every day. There are several stories about the origin of that mandate, but none has been corroborated. According to one story, the Senate’s bean soup tradition began early in the 20th-century at the request of Senator Fred Dubois of Idaho. Another story attributes the request to Senator Knute Nelson of Minnesota, who expressed his fondness for the soup in 1903. The recipe attributed to Dubois includes mashed potatoes and makes a 5-gallon batch. The recipe served in the Senate today does not include mashed potatoes, but does include a braised onion. Click here to check out both Senate recipes. No matter how you like your ham and bean soup, here’s my take on this American classic. Enjoy, and let me know what you think. • Note: homemade soup often develops more flavor if you let it sit in the refrigerator overnight and serve the soup the next day. 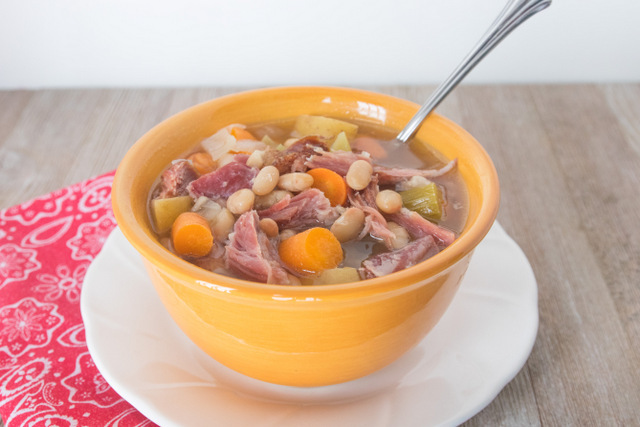 This Hearty Ham and Bean Soup is so good, though, that I understand if you dig in right away! @Copyright 2018 Darcy Maulsby & Co. The Iowa State Fair is a homecoming for Iowans, and the historic buildings that grace the fairgrounds in Des Moines provide iconic venues for this statewide family reunion. There’s also a lot of surprising history behind many of these structures, from the Agriculture Building to the Livestock Pavilion. While the first Iowa State Fair was held October 25-27, 1854, in Fairfield, supported by a total operating budget of $323, the fair moved to its present location in 1886. Between the time the Fair Board purchased the land in June 1886 and when the fair opened in September 1886, crews constructed 67 buildings. “Of those, Pioneer Hall is the only one that remains today,” said Landis, museum curator at the State Historical Museum. By the 1900 Iowa State Fair, most of the buildings built for the 1886 fair were still in use. They were beginning to show signs of decay, however, and roofs were particularly bad. It was time for the Iowa State Fair to clean up the fairgrounds. One of the first new buildings added more than a century ago was the Livestock Pavilion. Back in 1901, more than 650 cattle were shown at the Iowa State Fair – only about 50 less than were shown that year at the International Stock Show at Chicago, Landis said. With future Iowa State Fairs expected to have even more cattle, the Iowa Legislature appropriated $37,000 for a fireproof steel-and-brick stock pavilion, similar to one that had just been constructed at the Illinois State Fairgrounds. 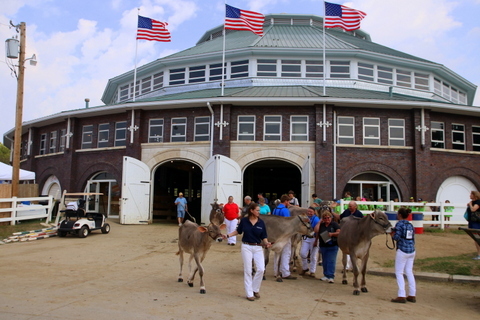 The Livestock Pavilion was the first major brick-and-steel structure built at the Iowa State Fairgrounds. “By constructing buildings out of these materials, the Fair Board gave the fair a sense of permanence and safety at this location,” said Landis, who noted that the new Livestock Pavilion officially opened for the 1902 fair and has been used for stock judging, lectures, entertainment and more for decades. A new Agriculture Building was constructed in time for the 1904 Iowa State Fair. This famous building is home to the beloved Butter Cow. The Agriculture Building is one of the finest examples of Double Jeffersonian architecture remaining in the world. A new Agriculture Building came along two years later, in time for the 1904 Iowa State Fair. Located at the intersection of Grand Avenue and Rock Island Avenue, the Agriculture Building was built along the route to and from the State Fair from the Rock Island Railroad depot. From the beginning, the Agriculture Building has been used as the agricultural, horticultural and dairy building. It’s home to the famous Butter Cow and other butter sculptures, which have been part of the Iowa State Fair since 1911. The building’s design was inspired by the Exposition Halls at the Columbian Exposition, the world’s fair held in Chicago in 1893. The Agriculture Building is one of the finest examples of Double Jeffersonian architecture remaining in the world. 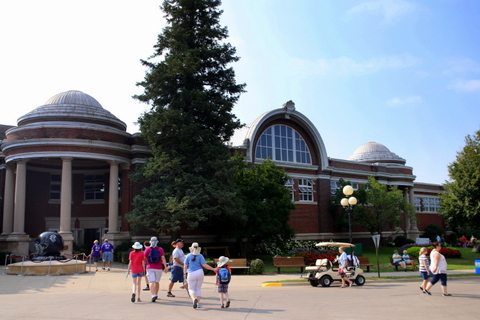 “Building a structure of such grand scale – with 33,800 square feet of floor space – suggested to visitors that the Iowa State Fair was an event of both civic and social importance,” said Jessica Rundlett, special projects and outreach coordinator at State Historical Museum of Iowa, who assisted with the Iowa State Fair walking tour. Kyle Andrews with the Wayne FFA chapter exhibited hogs during the 2017 Iowa State Fair. The Swine Barn was built in 1907. When a new Swine Barn was constructed for the 1907 Iowa State Fair, the roof covered 185,000 square feet of stalls, exhibition areas and two central show rings that could seat more than 800 people. “The Homestead newspaper said you had to see it to believe its grand size,” Landis said. The state appropriated $75,000 to build the Swine Barn. The building’s roof profile is designed to provide superior lighting and ventilation. The long open windows at roof level and open exterior walls draw in fresh air. Today you can see the Big Boar at the Swine Barn, as well as the Avenue of Breeds, which is coordinated by the North Polk FFA. The Horse Barn was completed in 1912 for $25,000 and renovated in 1929. Measuring 156 feet by 224 feet, the new barn could accommodate 132 draft horses and a like number of ponies, according to the Homestead newspaper. Th article also noted the new barn was equipped with water troughs, wash stands, sanitary feed mangers and automatic hayracks, Landis said. 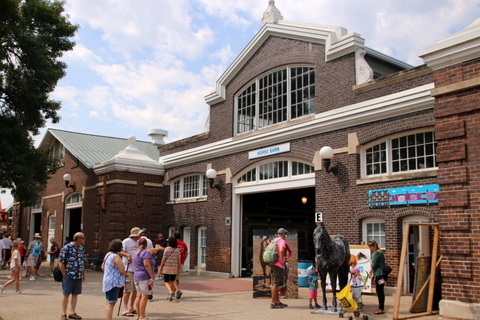 The Horse Barn was completed in 1912 for $25,000 and renovated in 1929. The Iowa State Fair’s building boom of the early twentieth century included the new Cattle Barn, which opened for the 1914 fair. While the original barn could accommodate 108 head of cattle, the barn now has ties for 1,600 cows, thanks to multiple expansions through the years. Among the early proponents of Iowa’s cattle industry was Iowa Governor William Larrabee of Clermont, Landis noted. Larrabee helped introduced Brown Swiss dairy cattle to Iowa after studying the breed and concluding Brown Swiss were best suited for Iowa’s climate. Today, the Cattle Barn is named for John Putney, a farmer from Gladbrook who was also a long-time cattle exhibitor, president of the Sale of Champions and beef superintendent. Putney was appointed the first executive director of the Blue Ribbon Foundation, which has raised more than $135 million in the last 25 years to renovate and preserve the Iowa State Fairgrounds. In 1915, the state legislature appropriated $14,000 to build a sheep pavilion. 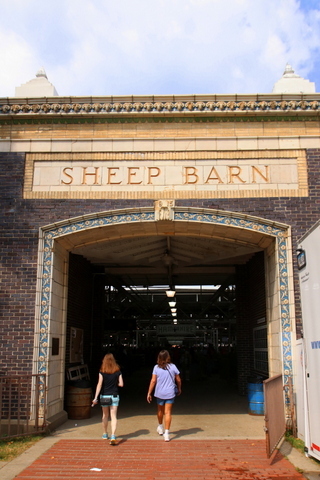 The Sheep Barn opened for the 1917 Iowa State Fair. The building is notable for the detailed terra cotta designs on the east façade, including a row of rams’ heads near the roof. 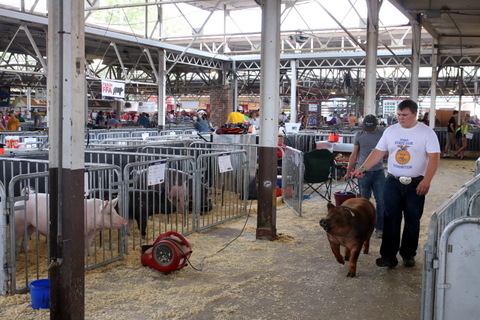 During the Golden Age of Agriculture, state funding was available to construct a wide range of livestock barns at the Iowa State Fair. In 1915, the state legislature appropriated $14,000 to build a sheep pavilion. The Sheep Barn opened for the 1917 Iowa State Fair. The building is notable for the detailed terra cotta designs on the east façade, including a row of rams’ heads near the roof. The Iowa State Fairgrounds was listed on the National Register of Historic Places in 1987. It’s a fitting honor for a unique venue filled with many architectural marvels. “The late Bill Wagner, a preservation architect from Iowa, noted that ‘the complex contains a representative collection of almost all architectural styles for most of the past 200 years,’” Landis said. A morning talk-show host on WHO Radio in Des Moines posed an interesting question when former Iowa Governor Terry Branstad was confirmed as the U.S. ambassador to China on May 22, 2017. The broadcaster asked what might define Branstad’s enduring legacy, and he suggested it may be Branstad’s service during the 1980s Farm Crisis. The more I thought about it, the more I agreed. I was just a kid in the 1980s Farm Crisis and didn’t really understand what was happening, but I knew it was bad. I remembering writing a poem about the Farm Crisis in 7th grade in 1987 for my contribution for a time capsule that was buried in Lake City. Sheltered as I was from my family’s financial realities, I had no idea my dad only made $800 one year during the peak of the Farm Crisis. Still, that was far better than what some other farmers were experiencing. As one farmer told me during a recent interview about his family’s Century Farm, the thing he dreaded the most during the Farm Crisis was the phone ringing. “You never knew who it might be or what bad news it might be,” he said. 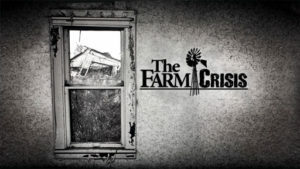 The Farm Crisis was just starting its brutal transformation of Iowa agriculture when Terry Branstad was first elected governor of Iowa in 1982. This new era was a far cry from the heady go-go days of the 1970s, when agriculture was booming, and making good money in farming was not only possible, but almost easy. By the early 1980s, however, a combination of national and international factors, including a Federal Reserve Board policy of high interest rates to fight inflation and a grain embargo against the Soviet Union, devastated the farm economy. Crop prices to dropped below the cost of production. Land values plummeted. Countless rural Iowa banks closed. “All of us who lived in Iowa at the time saw friends and neighbors lose their family farms and struggle with what to do next to earn a living,” said Iowa Sen. Charles Grassley, who recalled the Farm Crisis in a 2015 press release he issued about Branstad becoming the longest-serving governor in the nation’s history. By the time Branstad took office as governor, individual farmers across the state were hurting. No one really wanted to believe it was as bad as it was, but agriculture was in serious trouble. In early December 1985, an eastern farmer who was apparently distraught over his finances killed the president of his bank, his neighbor and his own wife before he killed himself. Dale Burr, 63, who farmed near Lone Tree, made national headlines after he walked into the Hills Bank and Trust Company and shot its president, John Hughes, with a 12-gauge shotgun. With farmers in desperate need of help, the Iowa governor’s office created the Rural Concern Hotline to provide assistance where possible. The state tried to help producers with debt restructuring as much as it could. Even Hollywood took note. Two popular films, Country and The River, drew the eyes of America to the plight of the nation’s farm families. Soon, Hollywood stars like Jessica Lange were testifying before Congress about the Farm Crisis. Far from Congress and Hollywood, however, Branstad relied on his small-town and farm background to lead Iowa through the Farm Crisis. Branstad was at the forefront of creating a new environment to do business. He welcomed and actively encouraged innovation that would capitalize on Iowa’s bedrock work ethic and strong schools. As a result, agriculture continues to be a mainstay of the Iowa economy while providing the economic engine that benefits many other employment sectors, including renewable energy, manufacturing, crop research and much more. Ironically, some of Branstad’s actions in the Farm Crisis didn’t seem that significant at the time but would benefit agriculture decades in the future. In 1985, while still in his first term as governor, Branstad welcomed Xi Jinping, who was then a Communist party official and feed cooperative director from Hebei Province. 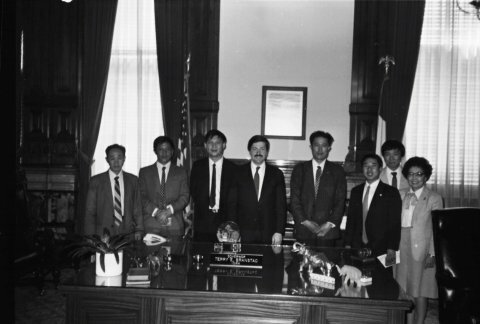 Xi Jinping, who is now the president of China, spent several days in Muscatine in 1985 leading a delegation of Chinese government officials who saw Iowa agriculture first-hand and became acquainted with Iowa farm families. That visit 32 years ago forged an unlikely bond between China and rural Iowa that endures today. I believe this bodes well for rural Iowa and our role in the global economy as Branstad serves as America’s ambassador to China. It’s also a large feather in the cap of an Iowa farm kid from Leland, population 284, whose legacy as Iowa’s governor and ambassador to China can’t be told accurately without looking back to those painful, pivotal days of the 1980s Farm Crisis. This column first appeared in Farm News in June 2017.